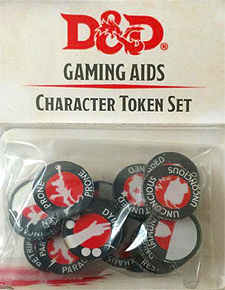 This token set is designed to allow player’s to easily, and quickly, track their character’s status effects. If your character is frightened, paralysed or unconscious, your allies will be able to see at a glance that you are in need of help. Because all of our full-colour tokens are made of durable perspex they are wet-erasable, so you can write additional information straight onto them. The combat tile provides a place for player’s to keep a running total of constantly changing statistics like character health and resources, all without dirtying your character sheet with eraser marks.